R2-D2 Day: Sign a White House petition to honor the "selfless, not selfish" Star Wars robot. I can’t recall if my 6-year-old son (OK, I still feel bad about subjecting him to the horribly age-inappropriate “You were the chosen one” fiery scene in Episode III) said this while the cute little droid was saving Padme’s life; destroying those battle droids on the Separatist ship en route to saving Obi-Wan Kenobi; fixing the Millennium Falcon’s hyperdrive; saving Luke, Han, and Leia from Jabba the Hutt; or shutting down the Death Star’s garbage cruncher in the nick of time. But Sebastian had a point. Indeed, Star Wars would have been a rather short and unsatisfying saga in the absence of the wily Astromech Droid. In A New Hope, the one that started it all even if it was Episode IV, it was R2 who brought the Death Star’s design plans to Obi-Wan along with Princess Leia’s “You’re our only hope, Obi-Wan” hologram plea. Without R2, there is no bringing the band back together—remember how he escaped Luke’s desert abode overnight to search for Obi before Luke can comply with Uncle Owen’s order to erase the droids’ memory? R2, along with his nervous counterpart C-3PO, Anakin Skywalker (Darth Vader), and Obi-Wan Kenobi, are the only four characters to appear in all six Star Wars movies. R2’s role is by far the most expansive of all characters. He is there to provide comic relief along with C-3PO, but he is also the Republic/rebels’ IT department, institutional memory, navigator, improbable action figure, and most winsome personality. It’s as if George Lucas wants to put all the bigger egos in their place by having R2 be the one to save the day in every movie. 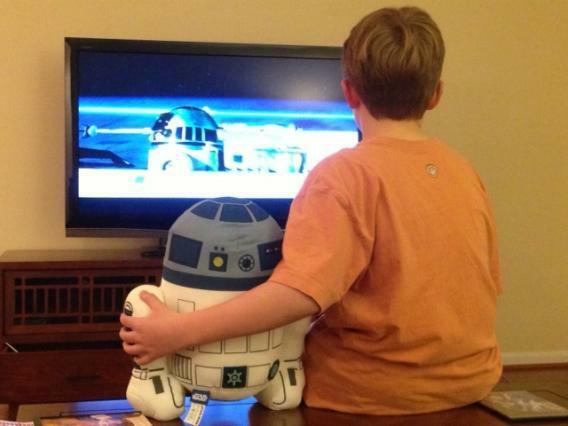 Now, R2-D2 is also playing a larger role—that of role model—in my son’s upbringing. We’ve talked about R2’s devotion to team, and how the droid works tirelessly to help the others without ever whining like some others in the saga (we won’t mention any names) or seeking greater glory for their deeds (they know who they are). R2’s mantra, we decided, is “Selfless, not Selfish,” and his example is such a powerful one that we’ve observed our own R2-D2 Day the last two years—a holiday to celebrate the little guy’s deeds but also, even more importantly, to commemorate unheralded heroes everywhere. Think about your workplace and community, or any social circle, and identify the R2 in the mix. There typically is that one person who abides by the “selfless, not selfish” mantra, the indispensable person who gets things done, cares about the collective, and often gets no recognition. The first year we observed R2-D2 Day (we picked May 23 for no other reason than it was the day R2 was featured in Sebastian’s Star Wars desk calendar), Sebastian played hooky from school and we bonded together. We talked about R2’s deeds and the meaning of “selfless not selfish,” made drawings of the droid, talked about people in other realms who embody R2’s virtues and then played a lot of outdoor games together. By day’s end, we felt guilty upon realizing that R2 might not approve of people playing hooky on his day—so not his style. So we’ve since been thinking about how to be more present and engaged, rather than playing hooky, in his honor. Friends we’ve talked to seem to share our view of R2 and about the lack of appreciation such characters get in our own lives, and so we decided to try to get more people excited about R2-D2 Day. I mentioned to Sebastian one day, in a different context, that I’d read how people could author petitions on the White House website, and that’s when he suggested we do one for an R2 Day. He was so excited at the thought that our idea might cross President Obama’s desk. So please help us out by signing his petition for an R2-D2 Day, to promote a “Selfless, not Selfish” movement.